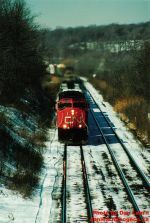 Description: CN freight train climbing the Niagara Escarpment on it's way to Niagara Falls. Description: Nose shot of Canadian National SD75I #5729. Description: Right after the new outbound crew got on they let me up in the 5729's cab. Description: CN coal train C73891 (Pond Creek Mine/Ferber, IL to Convent LA) hits the marker at MP 859.0. Title: Passing a freight in the wilderness somewhere in between Vancouver and Jasper. 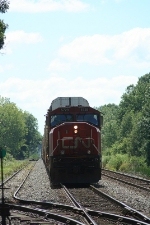 Description: Seen from the rear Park car of the Canadian. 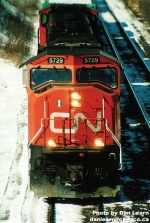 Title: Three CN SD70's in Jasper. Description: I have picture of 5729 from the back of the Canadian taken 3 days prior. Description: 9628 just came out of the shops. Description: Our first CN was this southbound. I didn't get an approach shot because my video camera was malfunctioning. I had to keep my finger on the zoom control to stop it from zooming itself in to maximum telephoto.